What to watch for this upcoming weekend in Athens, GA.
Classic City Classic has consistently been the springboard for teams seeking to assert their dominance before the competitive spring season. Last year, UMass rolled through the competition at CCC to stake their claim as a top title contender, a moniker they held all spring, up until a disappointing conclusion to their season in Raleigh. Harvard also put together an impressive performance at last year’s CCC, showing the first glimpses of the potential that they achieved at the College Championships. So who will be the standout performers at this year’s edition? This weekend in Athens, Georgia, we’ll get a look at many big east coast teams and get a sense of where teams will stack up in January. 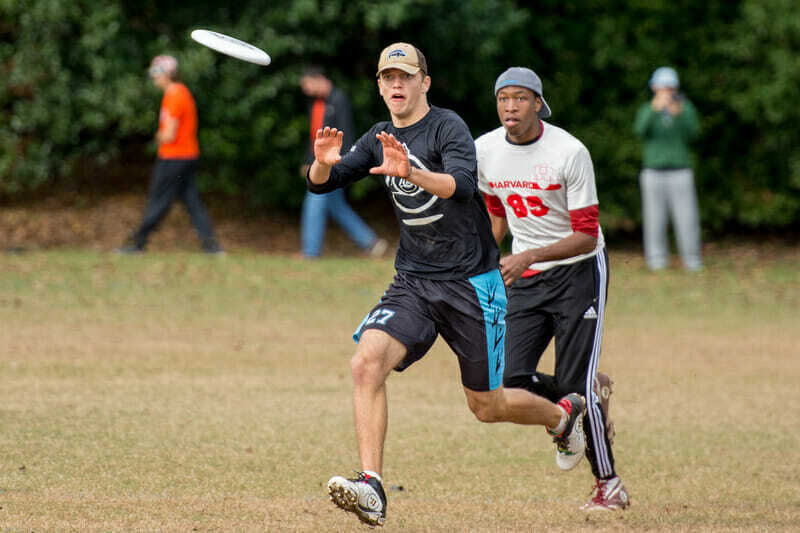 Ten teams from Ultiworld’s 2017 pre-season D1 College Power Rankings will be competing this weekend and pool play will offer some intriguing matchups. Here’s a breakdown of the what to watch for on Saturday. Pool A is headlined by a powerful UMass team. Despite losing one of the most dominant physical specimens the college division has ever seen, UMass remains scary, returning a large portion of their 2016 core including stars Tannor Johnson, Ben Sadok, and Connor Kline. A Babbitt-less ZooDisc squad should be able to stay ahead of the pack on Saturday. The real drama in pool A comes from two inter-regional matchups. Saturday’s fifth round will feature a Regionals game-to-go rematch between two rival southeast contenders, Florida and Auburn. With both programs trying to find a new identity after graduating All-Region stars, Auburn has already notched a win against Florida this fall and appears on paper to be the deeper team at this point in the season. Further down the pool are an up-and-coming Virginia Tech program and a young NC State squad packing a tremendous rookie class — six players out of the Triangle’s Youth Club national championship squad and a pickup out of Yorktown High School. With so many new faces to work in, how successful the Wolf Pack will be in the regular season is up in the air right now; their Saturday game against Virginia Tech will give us a sense of who the third team in the Atlantic Coast might be this year — and whether a third Atlantic Coast bid is back in the realm of possibility. Pool B will feature a storied matchup between a new-look Pittsburgh squad and a veteran UNC team looking to assert itself as a true title contender this year. Pittsburgh’s 2017 potential is hard to gauge right now; a loss to Case Western earlier this fall certainly raised some eyebrows, but it’d be foolhardy to write off such a strong program this early in the year. A matchup against UNC could certainly put some fire into a new Pittsburgh team looking to develop a complete roster. Sam Van Dusen and Mike Ing will be very exciting to watch, with Van Dusen in particular being forced into a larger role this year. UNC will be bringing the kind of veteran playmaking and energy that we got a big taste of last year at College Nationals. Walker Matthews has become an excellent hybrid player alongside the handling of Matt Gouchoe-Hanas and Elijah Long. CCC may feature the return of Gouchoe-Hanas off of a lingering ankle injury sustained at Club Nationals, and will certainly feature the return of veterans Norman Archer and Nick Macleod. Pool B will also give us a chance to see what UConn has brought back for 2017 after their very successful 2016 season. Mike Rice and Gavin Clemmey are going to be exciting to watch this weekend alongside a large supporting cast of returners. The final round of pool play will feature what should be a great game between Pitt and UConn to finish the day. On the face of it, Pool C appears to be the weakest of the bunch and is littered with question marks from top to bottom. Harvard’s success this year will almost certainly be defined by the performance of the clear favorite for Player of the Year, John Stubbs. But with Stubbs abroad this fall and the team still coping with the loss of Mark Vandenberg, Red Line will be searching for someone else to step up in a big way if they are going to find any success in Athens. It’s not hard to imagine them falling from their spot atop the pool before Saturday is out. Michigan is returning Noah Backer and Alex Russomanno as fifth year captains for a team that generally performed well at last season’s College Championships, finishing in a tie for 9th. With a deep squad and a quality coaching staff, this team will be out to prove they should have been listed in the preseason Power Rankings. Their third round faceoff against Harvard will be a rematch of a game that Magnum won in Raleigh this past spring. Florida State took a big hit from the loss of their two offensive stars Bobby Patterson and Connor Holcombe. Like Harvard, DUF will be searching for someone new to step up and take control of the team. Their matchup Saturday morning against Michigan will be an interesting test for both teams looking to break into the top 25. The bottom three in this pool — Georgia Tech, South Carolina, and Southern Georgia — will all be looking to snag a scalp of one of the traditional nationals contenders seeded above them to make a statement ahead of the spring season. Pool D will give us a great look at Georgia and UNC Wilmington at full strength. Georgia brought back excellent returners for 2017 with Parker Bray and Nathan Haskell leading the pack for the hometown favorite. UNC Wilmington may have a new look with the loss of their key handlers and the departure of head coach Greg Vassar, but they will be fielding an excellent returning class of players in Jack Williams, Austin McGrayne, Kevin Mateer and fifth year pickup from UNC, JD Hastings. The Seamen have a big challenge ahead to fill the shoes of Charlie Lian and Xavier Maxstadt but they may find an answer in their lefty freshman Connor Russell, who played for YCC runner-up DEVYL. New Head Coach Brian Casey has openly expressed how valuable Russell is to Wilmington this year. Wilmington’s high-profile matchup against Georgia in pool play will be a great test for the freshman. The other featured matchup from the pool to watch is Case Western against Brown. The Fighting Gobies have already thrown themselves back into the mix as a possible sleeper in the Ohio Valley with a win over Pitt in October. Brown looks like possibly the third team in New England this season behind Harvard and UMass; with Red Line’s high profile turnover of players, a solid performance from Brown this weekend could see them close the gap on their regional rivals. Their game against Case Western is certainly expected to be a good one. Ultiworld will be on hand to shoot six games in pool play as well as covering the Sunday bracket; additional games will be made available by NC State’s Jinxcam. Two quarters games, both semis and the finals will be available on Ultiworld’s subscription package and on NC State’s youtube channel. Comments on "Classic City Classic 2016: Tournament Preview (Men’s)"